Our Melbourne events are run by Guru Dudu, Disko Duk Duk, Mucho Micho, T-mar Superstar, Disko YoYo and Lila La’Diva. They are also available for private bookings. Join Dani Disco, Mambo Mama and Funky Fox for some fun around Brissie. They are also available for private bookings. We are now running ongoing tours in Northbridge and Fremantle on the first Friday of each month with our newly trained Perth team of tour guides. They are also available for private bookings. Thanks for a great time at Perth Fringe this year. Facebook album of pics here. Guru Dudu and his team will be returning to Edinburgh Fringe in 2019. Tickets will go on sale online on May 16, and the printed program is released on June 5. More info coming soon here. Our London team comprises Señor Samba, Maestro Mania and Sparkle Arkle who featured at the 2018 Edinburgh Fringe to sold out audiences. They are also available for private bookings. June onwards – more summer festivals and gigs to come, watch this space or join our email list! Please be mindful of your personal safety and the safety of others while on the tour. The headphones decrease your ability to hear regular noises on the street. The headphones are also fitted with a volume switch so you can adjust the sound to an appropriate level for your safety and enjoyment. 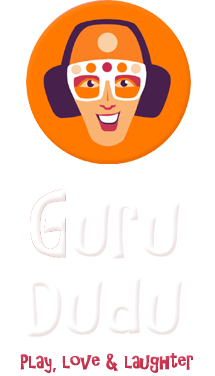 All tour attendees participating in a Silent Disco Walking Tour do so at their own risk and waive any liability claims against Guru Dudu Productions when they agree to join a Tour. This includes personal injury as well as loss, damage or theft to any walker’s property while they are participating in a tour. Any child under 12 years must be under supervision of an adult at all times. We acknowledge the original custodians of all the lands that we dance and walk upon, and all of the generations who have danced on these same lands for many thousands of years before us. We kindly acknowledge the music artists and producers who created all of the fabulous music that we play in our tours – bringing joy to so many people. We pay a portion of all ticket fees to the music licensing agencies in each respective country.